It has been a miserable, cold few days in Dallas - we got an ice storm that has kept everyone housebound. 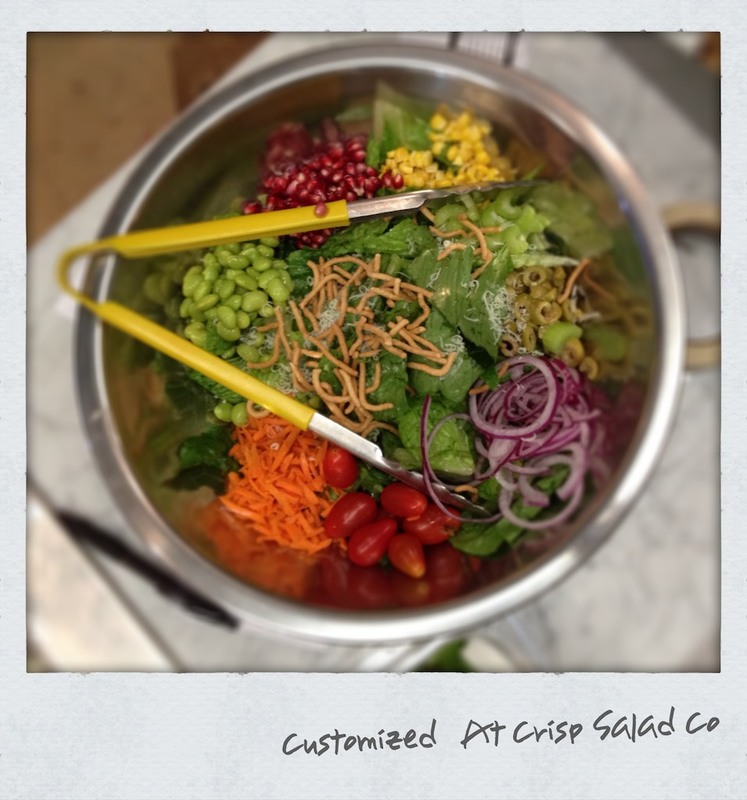 You would think when it's cold and icy outside you would be craving some great comfort foods like soup and chili, but I haven't been able to stop thinking about getting a fresh, healthy salad from Crisp Salad Company. What on earth would make someone venture out in a blizzard for a salad? For starters, owners and management. This little gem just opened up on lower Greenville Avenue in Dallas and is the effort of a group of friends who wanted a local place where they could eat healthy as well as eating well. Founder John Zimmerman lives in the area and hosted Sunday dinners for months with friends and partners trying out new ideas and sources. What they came up with will make you a believer - small batch salad dressings that are mostly gluten-free and are truly the best dressings I've ever tasted. They utilize fresher than fresh ingredients and source as much locally as possible, and they have an eye for detail like you rarely see or taste including roasting the cauliflower with curry and infusing the raisins with tea that takes them to a whole different level. I started my Crisp adventure with their Greenville Cobb: herb grilled chicken, Romaine lettuce, Maytag Blue Cheese, grape tomatoes, bacon and a Cider Dijon Vinaigrette that didn't over or underwhelm the other ingredients. They also added some shrimp on top of mine, and I'm not a seafood lover and not a big shrimp eater, but they were truly the best shrimp I've ever had. Blaine Duhe who is the General Manager and comes from an extensive restaurant background shared that they brine the shrimp for a short amount of time then put them on the grill. They have this exquisite, delicate flavor and texture that is the perfect compliment to the salads. I then went on to try the Street Taco Salad, a Customized Salad and a bowl of their Chicken Poblano Soup, and each one made me want to come back and have the same thing again, and again and again. If you like some wine with your salad they have some great offerings, and free parking is available in the back. I hope that you will join us in supporting this wonderful new locally owned and operated establishment, and that you will share what your favorite Crisp offerings are!